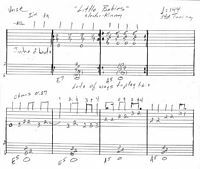 Sunday, February 05, 2006 Guitar Tab for "Little Babies"
The Sleater-Kenny Archives site was"Obsessed with Sleater-Kinney. A great site. The "Official Sleater-Kinney Site" went live in January, 2004. Sleater-Kinney Concert Reviews lists concerts back to February, 1999. Some have set lists. You can comment on performances if you like. You might be interested in some Pylon guitar tabs at tk's Pylon pages. Mime has some Sleater-Kinney guitar tabs too! Sleater-Kinney Tour Dates & Reviews is no longer updated but it reviews shows 1994 - 2000. Excellent. http://www.electrip.com/sleater-kinney/ is new as of 6-8-03. It has a very good disography and there is more to come. http://www.sleater-kinney.net/ is new and fresh (on 3-8-03). It has a very usable Lyrics Page. It also has a forum, maybe the most useful and pleasant to use in S-K'dom. Get Up with Sleater Kinney site and Get Up forum. http://www.sleater-kinney.org is under "reconstruction" but has 2002 tour dates. It has a forum. Indie Darlings: Sleater-Kinney Online splash page but it's a little quicker to go here. It has a forum too. Bunch of links on this page. Bunch of tabs that require "Guitar Pro" software which is cheap but not free. I don't own it (yet). The Sleater-Kinney Yahoo Groups: The for members wordsandguitar group. The public Sleater-Kinney2 group. The for members Sleater-Kinney group. The for members Sleater-Kinney_discussion group. From Mime: he's created the "The Rock Hard Times," an ambitious project to the the IMDB and Wiki for music. Hello everybody in my address book! I hope this letter finds you all well and happy. I myself am doing just peachy these days.I've finished a project now that I've been working on for over 8 months so I'm very happy actually. Some of you have heard me talking about it before and describing it but for those of you who don't know here's the lowdown. Basically, I've made a music website. Ok, great, you're saying - another music website to add to the million other ones already out there on the web. Maybe, but I'd like to think I've created something different. Basically, it's a combination of a lot of different ideas I've had - but the main site that it's similar to is IMDb.com (http://imdb.com) IMDb, if you don't know, is a movie database website where you can find out basically anything and everything about a particular movie. I use it all the time and I know a lot of other people that check out frequently too (*cough* tony *cough* - (he lives in Hollywood)) <-- and, yes, I always match my parenthesis (jokes for nerds, jokes for nerds). Anyway, I always felt it was an awesome site and that there wasn't really a site similar for music that did what IMDb does for movies. Another inspiration for the site is Wikipedia. Now, I understand Wikipedia has its pros and cons but one of its great (at least in concept) ideas is that it can be edited by anyone. So, this site does that too (but a little differently than how Wikipedia does it). Finally, the last main idea was that the site would also let me have an account there and keep track of my favorite artists that are on tour - you know, see who's coming to town this month, see who's got a new album they just released. I'm an pretty big audiophile and I've got about a 1000 distinct artists in my collection (some with many songs, some with just a few). And really, it's hard to keep track of all of those bands and people - and it's something that I really would like to do. So, right now with the help of my great friends Andja, Eli, and Michele we've added about a 100 bands (or so) to the database (and many more individual artists). Some big names, some little. And the idea is that artists and fans (like myself) can contribute to this site to make it larger, increasingly more complete, and, well, rockin'. I call the site: The Rock Hard Times. I actually (because I am crazy in my own way) released 3 different projects all at the same time yesterday. The second project is another website that is a simple storefront to Amazon.com's store (took me about 2 or 3 days to do - not like another 8 months). In other words, you can search Amazon.com's store through this website but as a stripped down version. And the last project I released is major update to my long-standing program FireFTP (almost at 3 million downloads, baby! by the way, in case you were wondering, the new version is technically still 'pending release' but it should be up today or tomorrow). Obviously, most of you are probably only going to be interested in the first one. The second one is pretty cool (I like to think) for a simple little storefront. And the third is for us web techies so there's not too many of you like that. So, anyway, that's what's new with the Mime. I hope you like the new site. If you do, tell your friends, that would be awesome. Guitar Tab for "Little Babies"
Here is the Guitar Tab for "Little Babies" from Dig Me Out. I have finished but I've done the verse and chorus. Not a difficult song. It may be S-K's most country song. Not a bad thing. I don't remember why I havn't done it before. What to do next? E-mail me if you have any ideas. I'm eagerly planning to watch the American Masters "Bob Dylan: No Direction Home" documentary, but who knows when? I don't know how to place my sentimentality regarding Dylan tunes except they remind me of many times. Some of them are still playing in my head. "Dear Landlord" is in the back of my brain right now. His performance of "You've Got to Serve Somebody" at the Grammy show is something I'll never forget. I was musically aware when he first hit the scene. I like the songs and I'm in awe of the talent. But I think to myself, "My kids will probably never hear him, so is their life ruined?" I guess not. Who knows, there might be a buzz someday and all the cool kids will rediscover him. Better if they rediscover Bach, et al. Here's an article saying we ruin pop with analysis and deification. Sleater-Kinney worship gets in my way too. There, I've said it. I like music as much and probably much more than I used to, but not like "that" anymore. P.S. I found myself watching TNN's 100 greatest county duets. Many were truly great. Loretta and Conway doing "Louisiana Woman, Mississippi Man." and Johnny and June doing "Jackson." The house band for the live performances was breathtaking. It's a shame rock and roll can't do it. They could of course and it can be great. Think "Shiny Happy People;" it's a rare shiny happy rock song. TUCKER: Oh, yeah! I use a DOD EQ pedal to inject a lot of bass into my sound. I also use a ’90s Vox overdrive and an Electro-Harmonix Bass Synthesizer, as well as a DigiTech Whammy and a Schumann Electronics Lion X for fuzz bass parts. What guitars are you using now? TUCKER: I usually play through the neck pickup on my Les Paul Special. I also use a Danelectro baritone in the studio. I got my Les Paul for free, because my husband turned instruments into skateboards for an Aerosmith film he was working on. Gibson sent instruments en masse. Some of them were broken, some were just fine, and what became my guitar happened to be really nice. Now I’m going to have to ruin your indie cred by exposing your Aerosmith connection! TUCKER: Yeah, I totally snagged my guitar from Aerosmith [laughs]. BROWNSTEIN: I was using a Vox AC30 up until we recorded the new record, when I switched to a ’64 blackface Fender Super Reverb because I wanted more versatility. The Vox is overpowering. It’s very loud on stage, and although it has a grittiness that I love, the midrange is really pronounced. I feel like the Fender fills out the highs and lows a little better, and it’s a much warmer amp than the Vox. My main guitar is a 1972 Gibson SG, and I also have a ’78 Guild with a Bigsby. The Guild is kind of brittle and “garage-y,” and the SG has a real warm sound. As far as pedals go, I have a Maestro fuzz, a Boss BD-2 Blues Driver, a Z.Vex Super Hard On, and a Roland AD-50 DoubleBeat—which produces some of the most blown-out fuzz distortion I’ve ever heard. 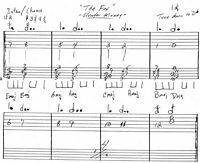 Guitar Tab for "The Fox"
Here is the Guitar Tab for "The Fox" from The Woods. It may be sludgy, but it's Sleater-Kinney sludge. It should be a lot of fun to play. Pinpoint accuracy is not required. In the intro/chorus Corin does an 8 chord progression with all major chords. Carrie goes all chromatic on us. She goes down in bars 1 and 2 and up in bars 3 and 4. It keeps the song off balance from the start. The verse is standard is a standard S-K mood change but it keeps the dissonance going. Corin does little 7th chords. Carrie bends her index finger strings to keep it woozy. Beats 3 and 4 of the second and fourth bar are way off the wall. The bridge is not very distinctive guitar wise but it's the most "normal" part of the song. My favorite song is whatever I'm listening to at the moment. The one that plays most in my head is "Youth Decay." I think it's the archetypical S-K song packed into 2:30. One of many great original songs. Who else can produce so many songs like this? It's a little rough and ragged. The vocals are charmingly unpolished. It has Carrie freight-training her riffs. All three sing. It has 3 1/2 different moods. The vocals start at the first beat (Think "All My Loving" by the Beatles). It seems like they are going to leave without you and you have to run to catch up with the song. Carrie's absolutely original riff bubbles along through the verse where the vocals, partly spoken, have attitude. There is pre-chorus riff. The mood changes for the chorus with power chords and flamethrower trilling vocals with octave harmony. Also original: the chorus is six bars long, rare in rock (or anywhere else). It would be math rock if it weren't so perfect. It lands us back in the verse a bit before we expect. The mood swings in another direction for the bridge with an ethereal vocal that harmonizes with a simple riff for the first two bars. It makes me think I'm getting a chance to catch up with the song. Then the "praying" voice plays against another batch of original Carrie riffs, changing moods again and picking up momentum. Finally the song outros by repeating the chorus with a final vocal twist. At the end it's like hitting a brick wall just at the right time. S-K songs end - they don't fade out. The bridge always "gets" me and I always get a lift when the verse returns after the bridge. S-K songs don't overstay, they usually leave you satisfied but wanting a little more. When I get time I'd better do a more complete job of the Youth Decay guitar tab. Pylon on July 7, 2005 at the Earl, Atlanta - what a show! Three of Pylon's songs have been playing in my head for more that 20 years from hearing them a few times in WREK. I only know the name of one, "M-Train." I just had to see Pylon if I could. For those familiar with M-Train: Woo woo! I saw both Sleater-Kinney and Pylon within 6 days. I am a fortunate person. If you like Sleater-Kinney are you guaranteed to like Pylon? Maybe, maybe not, more on that later. Pylon wasn't around for long and now they've reunited for a second time. They were the best Athens band that didn't "make it" in the era of the B-52's and REM. "Vanessa's History of Pylon" tells their tale. I'd argue that they were as good as any Athens band. Their signature sound is unique. There may be few opportunities to see them. So the wise folks at The Earl celebrated their 6th anniversary by featuring Pylon. God bless them. Pylon gave 100%, played 24 tight songs and two encores. They tore the roof off The Earl, impressed the crowd, and I think they probably impressed themselves too. So why should a Sleater-Kinney fan enjoy Pylon? Speaking for myself, it's the riffs. Pylon, the B-52's, and Sleater-Kinney rely on original riffs for their signature sound. The riffs are not your standard blues based riffs. Don't get me wrong, I love blues based rock riffs but that's not what we have here. Pylon songs are striped down and clean, no extra baggage, no strumming of chords. In one song the bass part is only one note. The bass and drummer are as tight a rhythm section as you can find and are the essence of all the songs. The rest is space for the guitar player, Rob, and singer, Vanessa, (a plus-sized, charming, unselfconsciousness woman who go-go dances when the spirit strikes) to provide the sparkle, sheen, crunch, and / counter point, always in the less-is-more mode. Like to dance at a show? Pylon don't play no stinkin' ballads. They dance-rock in the vein of the B-52's but with less. I don't own a single Pylon recording. I'm going to get some as soon as I can figure out the names of those two songs. I don't think you can "get" Sleater-Kinney on your first listen. Unless your first listen was live as mine was on May 27, 2000. July 1 was great show and a great crowd, I think, bigger than their last show here. I hope all of you get the see S-K live. What a great, engaging, and professional live band, what great songs. I enjoyed Dead Meadow's sludgey rock: dancing bass player, athletic drummer, fog machine, and "total package" singer/guitar player who just stood there and got the job done. They do highlight the S-K difference. If you replaced Dead Meadow's bass and drummer, they would still be Dead Meadow. Replace a member of S-K and it's no longer S-K. I love the guitar riffs and tend to focus on Carrie. Her singing this time was her best yet. She is a wonderful musician and charismatic performer. For her it's not about perfectly clean playing, inspiring tones or technical brilliance. Like the Rolling Stones, she plays tight without losing the rough edges. Her riffs are original and almost always unexpected. She seems to have a million of them parsed out through the S-K catalogue. The Woods songs: "Wilderness," "What's Mine is Yours," "Jumpers," and "Entertain." have those odd and original riffs. But Corin is spectacular on stage. From her modest demeanor she throws vocal lightning bolts. Full bodied and strong. I'm not sure she needs a microphone. Words fail me. Remove her guitar and she could dominate on any stage. Guitar wise, she plays the "easy" parts but her easy parts are the bedrock of the songs. During their performance I'd think, "where is that sound coming from?" It would be Corin. I do have some complaints though; your results may vary. First, the freak out in "Let's Call It Love." Did you notice that the crowd went dead? S-K is welcome to do what they like but I found myself looking away from the stage and checking the time. Even the frantic, non-stop dancers in front of me lost their mojo for while. When "Night Light" finally came around, the freak-out had blunted its beauty. I had to get my motor started again. Dead Meadow is better at freak-outs. Second, the cover, "Mother" by Danzig. S-K did a fine job on that song but I'd much prefer they'd done one of their own songs. Their songs are better than most others'. So between the freak-out and "Mother" I figure they could have done at least 3 more of their own songs. Finally I'm trying to compare the new "heavy" songs with the old ones when performed live. (Caution, I don't pay attention to the lyrics). To me, the new songs still sound like S-K to me with the guitars sounding a bit more sludgy. No problem by me. When "Burn Don't Freeze," "Sympathy," "Oh," and "Dig Me Out" came around, they sounded plenty heavy. But to me, the old songs have a certain sparkle that comes through a bit less on "The Woods." Oops, I failed to mention Janet. I'm don't know enough about drumming to make any decent comments. But I was in a place where I could actually see her face. I stood on a chair against the left wall. So, I could tell when she sang. I never realized how much she sang and or how important her vocals are to some of the songs. Her stock went way up with me last night and it was pretty high already. S-K can jam all they want. They've done enough great work already. There are plenty of jam bands but there is only one S-K; only one group that does songs like that. If the jam bands could write songs like S-K's, they probably would. I don't think they'll move towards jamming unless they are really bored or they are unable to write more great songs. One other small highlight for involves one of my music buddies: a musician and guitar teacher. When he recommends a show to me, he's always right. I told him about my S-K tabs so he started to pay attention. When he found out his grown daughter was going to the Atlanta show, he watched them on Letterman Monday. That convinced him to see the show. The last I saw of him last night he was slipping through the crowd towards the stage front. One more convert maybe. I feel like I did him a favor. Thanks to my music buddies: Dave, Bill, Sam, and Katherine. The views expressed within this site pretty much represent those of the author. Copyright (c) 2002 Terry Kearns. All rights reserved.